The 2012 Monaco Grand Prix had plenty of sub-plots, sidestories and points of interest aside from Mark Webber’s final victory in the Principality. Webber became the sixth different winner from six races in an open start to the World Championship, Romain Grosjean had more opening lap contact – and one other important story. 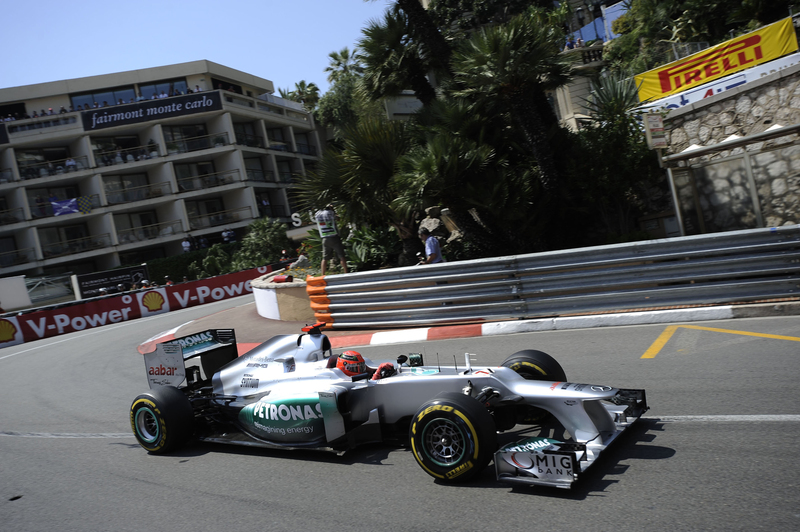 That was the performance of Michael Schumacher during Saturday’s qualifying session. The seven-times World Champion had failed to find the scintillating form seen during those Ferrari days at the beginning of the millennium ever since joining Mercedes for 2010 after three years away. Since that second coming his best result had been a fourth place scored at the famous Canadian Grand Prix of 2011 and 2012 had been beset by bad luck, collisions and sometimes lack of pace. Indeed, Schumacher went into the race weekend with a five-place grid penalty following an accident with Bruno Senna in the previous Spanish Grand Prix. Mercedes had had solid pace all weekend but were not considered to be amongst the favourites – aside from the Chinese Grand Prix in which they were running first and second before Schumacher’s retirement, the car had been inconsistent. However, in the second qualifying session both Mercedes made it comfortably through to the pole position shootout with Rosberg just ahead of fifth-placed Schumacher. Mark Webber’s time of a 1:14:381 looked like enough as Lewis Hamilton and Romain Grosjean both struggled to eclipse it. But Schumacher, one of the last men over the line, slapped in a 1:14.301 to take his 69th and final pole position of a glittering career. Post-qualifying, in the knowledge that he would start sixth, the then 43-year-old was delighted with the result. After contact with the pinballing Grosjean at the start, Schumacher remained solidly in the top eight through the Grand Prix until his retirement from a fuel pressure issue with fifteen laps remaining. He would stand on the podium once more before retirement at the end of the season with a third place at a chaotic European Grand Prix in Valencia.